I wonder what Abe would say. 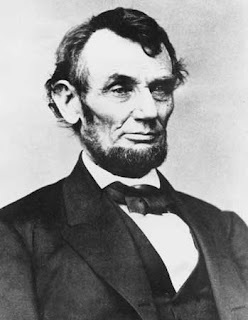 If our 16th president could suddenly come back to earth and experience a 21st century Thanksgiving with us here in the United States of America, how would he respond? In the past 150 years, the holiday has been secularized and the religious connotations—whether expressed by Lincoln or because the Pilgrims came to the U.S. to escape religious persecution, thereby giving the day a religious dimension even without Lincoln’s proclamation—have been stripped away. The secularization of giving thanks has all but given way to a day of shopping and individualistic pursuits. Thanksgiving is less about reflection and sharing moments with family and more about waiting in line at one’s favorite big box store. I wonder what Abe would say about all that. In all likelihood, not too many good things. This means that what all of you are doing this morning—gathering here in prayer; pausing to reflect on the many blessings that God has given to you, to your family and to the world; and then actually thanking Almighty God for these blessings—is counter-cultural! It’s not the norm anymore! It’s the exception, not the rule. The consumerist drive has supplanted a day of giving thanks with days of consumption. The impatience of consumers and retailers means no longer is Black Friday soon enough, but Thursday must now be invaded. It’s impossible to authentically give thanks when one can’t wait to get more. This, by the way, is why our Holy Father, Pope Francis, is always railing against consumerism! To a person steeped in consumerism “things” and the accumulation of more “stuff” are more important than God—and more important than other people. I can’t help but believe that on this issue Abraham Lincoln and our Holy Father would be on the very same page. That’s the way gratitude normally works. But there are some cases when the opposite is true. There are certain times in our lives when gratitude is best expressed by what we DON’T DO—like needlessly shopping on Thanksgiving. Dear Lord, we are beginning this day with you here at Mass—which is the best way to begin any day. In doing this we are honoring the desire of President Lincoln by offering (as he would put it) “Thanksgiving and praise to [you] our beneficent Father who dwelleth in the heavens.” Help us to express our gratitude to you during the remainder of this day by doing some things: by saying Grace before our Thanksgiving meal, by spending some quality time with some of the people through whom you have blessed our lives—and by remembering those in need. And help us also to express our gratitude by saying no: by saying no to shopping, by saying no to selfishness, by saying no to any and every temptation we may experience to put things before you and before our brothers and sisters. Amen. Some pictures from our 10:30a.m. Mass today--and our anniversary cake. In his book, Priests for the Third Millennium, Cardinal Timothy Dolan tells a story about a friend of his from the Archdiocese of St. Louis, Fr. George Lodes. In 1962, Fr. Lodes was in Rome, and had the privilege of meeting Pope John XXIII (now Pope Saint John XIII) in person. He met the Holy Father along with a number of other priests: they all stood side by side as the pope moved down the line to greet them one by one. 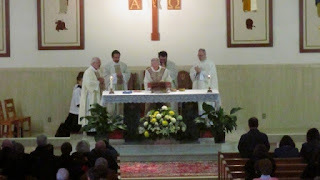 Each of the priests introduced himself, and told the pope what he did. The first said, “Holy Father, I’m a university president,” and then knelt to kiss the pope’s ring. The next said, “I teach in a college”; the third, “I’m a hospital chaplain”; the fourth, “I’m the chancellor of my diocese.” And on and on the litany went. Pope St. John XXIII understood the importance of a parish in forming disciples for Jesus Christ. After all, he had grown up in a parish himself—as almost all Catholics do. It is the place where all the faithful can be gathered together for the Sunday celebration of the Eucharist. 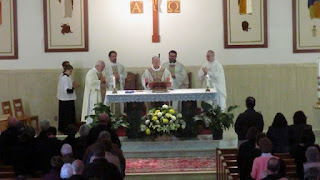 The parish initiates the Christian people into the ordinary expression of the liturgical life: it gathers them together in this celebration; it teaches Christ’s saving doctrine; [and] it practices the charity of the Lord in good works and brotherly love. 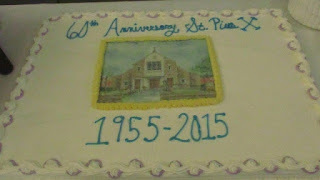 As we celebrate the 60th anniversary of St. Pius X Parish this weekend, we thank God for how these words of the Catechism have been lived out and experienced here in this place for the last 6 decades. 1. To bring people into a relationship with Jesus Christ, their Lord and Savior, and to empower them to live his gospel of love. 2. To help people to sustain and deepen (and, if necessary, restore) their relationship with Jesus Christ, their Lord and Savior. 3. To help people to prepare themselves to meet Jesus Christ, their Lord and Savior, when he comes to them as Judge. This, by the way, is why this passage from Mark 13 on divine judgment—which we heard as our gospel reading today—is so appropriate for a parish anniversary Mass. (Although I will admit when I first read it, I didn’t think it was so appropriate!) But it is! It’s appropriate because, when all is said and done, the most important moment of this life for every one of us will be the moment when we leave it and go to be judged by the Lord. In fact, that’s the ultimate reason for a parish’s existence: It ultimately exists to prepare people for God’s judgment and (hopefully) for their eternal reward. You know, a parish can have the greatest programs and the most enjoyable social gatherings imaginable, but if it doesn’t prepare its people to meet the Lord at the end of their lives here on this earth, all those programs and parties won’t matter. They won’t matter at all. 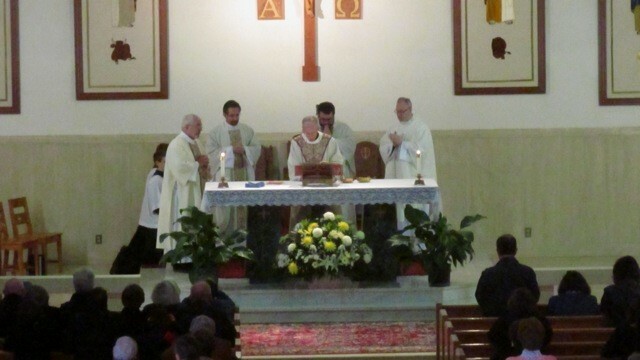 Today we thank the Lord for how this parish has fulfilled these 3 purposes since 1955. We thank God for the many good priests who have served here over the years as pastors and assistants—and the many others like Monsignor Struck and Fr. Giudice who have helped us out, even in their retirement. We thank God for how they have helped the members of this community to build and sustain their relationships with Jesus Christ and prepare for their eternal destinies. We thank God for those from here who have responded to the call to serve the Lord in the priesthood, the diaconate and religious life. And we thank God in advance for those who will respond in the future. (Yes, we do have more young people who are discerning at the present time. Praise God!) We thank God for the witness of so many married couples at St. Pius who have been married for 40, 50, 60 and even 70 years—who show us that, with the grace of God, lifelong commitments are still possible. We thank God for the many good and holy lay people from this place who have been spiritually formed here, and who have then gone out—and who are currently going out—to do great things in God’s service. This is a special place, my brothers and sisters—a very special place. Why do you think I’ve stayed here so long?! I know a great parish when I see one! And so do other people, some of whom are not from this parish or town or even this area. I’ll give you an example of what I’m talking about. Two Sundays ago after the 10:30a.m. Mass I locked the church as I usually do after the final Sunday Liturgy, and then I went out to lunch with two old friends from my hometown of Barrington. Well at about 2 o’clock they dropped me off at the rectory. And as I was standing on the front lawn saying goodbye to them, I noticed a car pulling into the parking lot. A man got out, dressed in a white Dominican habit (like Fr. Jordan Turano wears), and he began to walk toward the front doors of the church, obviously with the intention of going in—which he was not going to be able to do since I had locked all the doors a few hours earlier. So I went over to meet him. I didn’t recognize him at first, but once he said his name, Fr. Nic Austriaco, I remembered him from the excellent talks that he gave to the priests of our diocese a couple of years ago on one of our priest study days. The talks were on medical/moral issues. Fr. Nic is a biology professor at Providence College. He’s a brilliant guy; he has his doctorate from M.I.T.—and he does research in addition to teaching. So, of course, I let him in; and once we had finished our conversation, I left him there to pray. Now what really struck me about Fr. Nic’s request (and I began to think about this afterward) is that what he said about St. Pius is what people normally say about big, important shrines in the Church! I said the same thing at Lourdes and at Fatima and at other big shrines that I’ve visited in my life. Fr. Nic Austriaco said it about us. Just a note to thank you and your parishioners for hosting and participating in our first Holy Hour for Vocations last week. St. Pius X Parish is a spiritual powerhouse in the Diocese and I knew that you and your faithful would be welcoming and supportive. Please continue to work and pray for this important intention. “A spiritual powerhouse”—I can’t think of a better compliment that a parish could possibly receive from its bishop. It’s humbling and it’s gratifying at the same time. And it should cause us to praise and thank God. · And we have, as our patron, one of the greatest saints of the 20th century! With two heavenly intercessors like that—our Lady and St. Pius X—we can look forward, I believe, to many more blessings from God during the next 60 years—and beyond. There are certain subjects that I really enjoy talking about. Obviously Jesus and his Gospel are number 1; but there are others. I enjoy talking about current events, and social issues, and local news, and sports (at this time of year, most especially the Green Bay Packers—although not during the last few days after that horrible loss to Denver last Sunday night!). One thing I do not like to talk about, however, is money. But I will today—primarily because I have to. If you’ve spoken to your friends at other parishes in the state of Rhode Island in the last 18 months they might have told you that their parish was having an increased giving campaign in which people are being asked to prayerfully consider increasing their weekly contribution to their church—and to consider sharing more of their time and talent as well. The Bishop has asked every parish in the Diocese of Providence to do this to prepare responsibly for the future—and most already have (in fact some did their campaigns as long as a year and a half ago). The reason I’ve put it off for so long is not because I’m a procrastinator, because in most things I’m not. The reason we didn’t do this back then is because 18 months ago we needed to raise money for our fire alarm system—and more recently we needed to do that same thing for a new organ—and I was not about to place a double financial burden on my people. I made that clear to the diocese, and they agreed it was a good idea to hold off on it until now. Now you also might have been told by your friends from other parishes that they heard about this in homilies for 3 consecutive weeks. Although you will get a letter about this in the mail in the near future. Just a word now about that letter. There will be a suggested increase that you’ll see there. That suggestion will be based upon what you’ve given in the past. But it’s only a suggestion. Some may be able to increase more, some less—and some not at all. As we all know, the economic situation of many people in our society has not improved in recent years, and for some things have gotten a lot worse. But others among us have been greatly blessed by God financially—at least enough to make a modest increase in what we donate. Isn’t it interesting that the Lord gave us these readings for this particular Sunday? 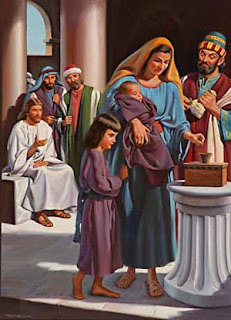 I say that “the Lord” gave them to us, because believe it or not I had no idea what the readings for this Sunday were when I made the decision to announce the increased giving campaign this weekend. This was simply the best weekend in the fall to do it given the walk-for-life and the anniversary celebration and everything else that’s been going on here. And she was blessed by Jesus for her sacrificial offering. Then we have the widow in today’s first reading, who “gave” to the prophet Elijah. But notice her gift was not monetary; it was a gift of a well-prepared meal to a starving man—which reminds us that as believers in the one, true God we are to be givers of our time and our talent, as well as givers of our treasure. Those of you men who responded to the invitation of the Knights of Columbus a few weeks ago to get involved in their organization—you will have the opportunity to share your time and talent with many people in our community in the future. 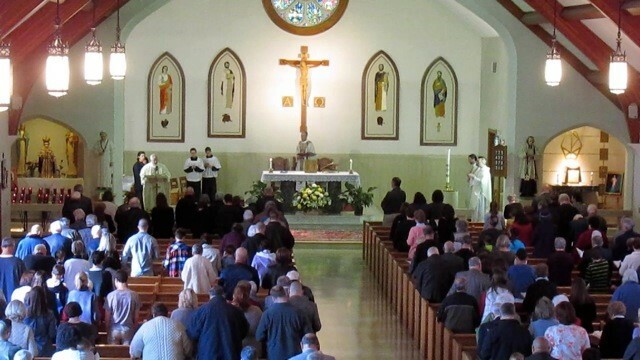 Thank God we are blessed here at St. Pius with many men and women who give in these other important ways—and many too who “give” their prayers (and who offer up their sufferings) for the sake of all that we do here to save souls and help those in need. I thank you for listening to me today, and I thank you, as always, for your ongoing generosity to our parish. This year we celebrate our 60th anniversary. More about that in my “regular” homily next Sunday. 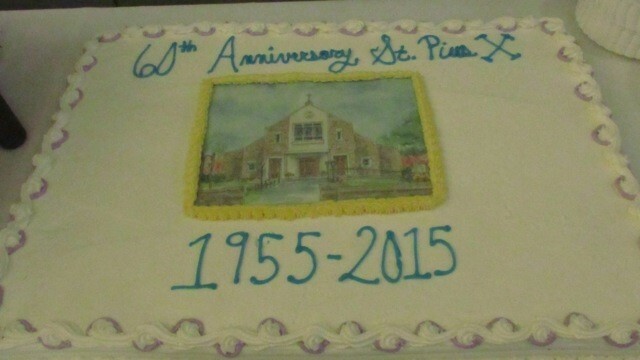 One of the reasons for this campaign is to assure that St. Pius X Parish will remain financially secure and stable for the next 60 years—and beyond. May God bless you all for helping to make that happen. We say we believe in it every time we recite the Apostles’ Creed. And, just as important, do we know the practical implications that it has for our lives? I should mention here that the word “saints” in this context doesn’t only refer to canonized saints, but rather to all those who are united to Jesus Christ by the grace of Baptism. So what, exactly, is the communion of saints? That, of course, is the “Readers’ Digest answer”—but it’s a good one to share in a homily (first of all, because it’s true; and secondly because it’s easy to remember!). The communion of saints is the Church. Which leads directly to the next question: And what is the Church? The Church, we know from Sacred Scripture, is the Body of Christ and the People of God. Now notice something. Notice we don’t say that the Church is the “Bodies” of Christ (plural), even though the People of God are currently living in 3 different locations or “states”: some are already in heaven; some like you and me are here on this earth; and others are being purified at the present time in purgatory and are thus being made ready for heaven. Jesus has ONE Body, not two or three. And that means the Church is ONE BODY—one Body united in charity—even though it currently exists in 3 locations. Our Catholic Faith teaches us that there is a spiritual bond of Christ-centered love that connects the Church here on earth (sometimes called “the Church militant”) to the Church in heaven (sometimes called “the Church triumphant”) to the Church in purgatory (sometimes referred to as “the Church suffering”). Actually, quite a lot! This very important teaching on the communion of saints has some very practical implications that we need to be aware of—and that we need to share with those who are unaware of them. The members of the Church triumphant (whose feast day is today, the Solemnity of All Saints) have arrived at their eternal goal and need nothing from us or from anyone else. But they have a lot to give! They have a lot to give to the Church suffering (the souls in purgatory) and the Church militant (all of us). For example, they give us their prayers (they intercede on our behalf); they give us inspiration (they are examples of faith for us to follow); and through the Church they give us some of their “merits” (that’s why we have indulgences). Hebrews 12 tells us that as we go through this life we are surrounded by a “cloud of witnesses”. These are the saints in heaven (canonized and uncanonized) who love us, who want us to someday be where they already are—and who want to help us to get there! And they will help us—if we ask them and strive to imitate them in our lives. As for the Church suffering, they are prayed for by the Church triumphant in heaven, and they are helped by the Masses and prayers and offered-up penances of the Church militant here on earth. And the good news is that we can also be helped by their prayers—although they cannot pray for themselves. The Church says, “No, that’s wrong. There’s a bond—an unbreakable bond—that exists between us and the souls in heaven and purgatory; and because of that bond (which we call the communion of saints) we can still affect one another and assist one another—even though we are living in different places. Have you ever met someone who was extremely upset about a relative or friend who had recently died—a relative or friend with whom they were not on good terms? Situations like this happen all the time—especially when the death of the person in question is sudden and unexpected. I indicated at the beginning of my homily that our belief in the communion of saints has some very practical implications. Well, this is certainly one of the most important of those implications. The truth is that there are many men and women walking around right now who are depressed and burdened because of what they failed to do for people who are now dead. And they think that at this point they’re completely cut off from these people and can do nothing to demonstrate their love and make amends. But they can! They can show their love; they can make amends! And the reason that they can do these things is because the communion of saints is more than just a nice theological theory. It also happens to be the truth. It also happens to be reality. And for that, we should all thank God!